A Stanford undergraduate has contributed to a discovery that confounds the conventional wisdom in lithium-ion battery design, pointing the way toward storage devices with more power, greater capacity, and faster charge and discharge capabilities. The undergraduate was part of a 10-person research team led by William Chueh, an assistant professor of materials science and engineering. In an article published in the journal Advanced Materials, the team explained how a material previously considered secondary in importance was actually critical to overall battery performance, and also devised new design rules for better batteries. 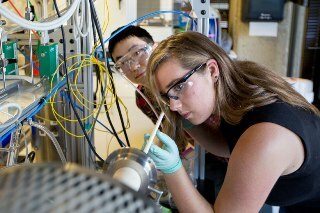 Graduate student Yiyang Li and undergraduate Sophie Meyer led the collaborative effort to design experiments that disproved an assumption shared by battery designers for more than 20 years: While lithium-ion batteries needed a substance called carbon black in order to function, the precise amount of that material had not been considered crucial to overall performance. "Our research demonstrated that isn't true," said Meyer, who started the experiments when she was a sophomore with no prior experience in materials science. Chueh praised Li, a PhD student who plans to become a professor, for supervising Meyer over two years of experiments that included the construction of scores of batteries from scratch and advanced observations using X-rays. "It was painstaking research that involved thousands of hours of hands-on work, and that is very unusual for an undergraduate to do," Chueh said, noting that the experiments epitomized Stanford's dual emphasis on cutting-edge science and training the next generation of scientists and engineers. Li reflected on the two-year-long process of experimentation with characteristic engineering aplomb and understatement. "Our work addressed a long-standing debate in our field," he said. Lithium-ion batteries have been commonly used in laptop and tablet computers, electric vehicles and renewable energy systems for more than two decades. These batteries typically contain cathode particles through which the electrons flow, an action that enables the battery to charge. These cathode particles are typically composed of lithium iron phosphate or lithium cobalt oxide, mixed together with carbon black, an inert material obtained by the incomplete combustion of certain petroleum products. Prior to the team's research, the quantity and dimensions of the carbon black nanoparticles weren't considered particularly crucial to a battery's function. "The industry standard for lithium-ion batteries is a low carbon model – say, 5 percent of the total material by weight," Meyer said. "But we found that isn't enough to guarantee rapid and efficient charging and discharging. Ultimately, the rate at which a cathode particle charges depends on how well it is connected to carbon black particles, something that varies a great deal within a battery." Li said that by upping the percentage of carbon black – as high as 20 percent in some experiments – they found that the cathode particles charged more quickly because they had more uniform carbon connectivity. But there was a tradeoff. Increasing the percentage of carbon black decreased the amount of cathode particles available to hold a charge. So although a battery with a higher carbon black content might charge faster, it would also have less energy because it has fewer cathode particles to hold the charge. "It's about finding the optimum balance and the best material," Li said. These results point toward possible future experiments to further optimize battery design. But such research would not be possible, Chueh emphasized, without the painstaking work that the team has accomplished to date. Over the past two years, Chueh said, Li and Meyer worked with their teammates to fabricate hundreds of batteries with different concentrations of carbon black. Each battery had to be analyzed for composition and performance. Among other things, that required the evaluation of nanometer-scale images of the battery materials obtained through Lawrence Berkeley National Laboratory's synchrotron, the Advanced Light Source. "I had a lot of questions, and I read a ton of papers in the field," Meyer said. "Then we had to figure out how to make the batteries: what ratio of carbon black to lithium iron phosphate to polymer binder to use; what order to add them in; whether to combine the mixture by hand or on a stir plate or in a mill; what temperature to mix at; and how long to mix the slurry, among a lot of other variables." Meyer, who is pursuing her co-terminal master's degree in materials science and engineering, said it was the hardest work she ever loved. "You end up with this sloppy black goop that you have to spread out very thinly as a film – 20 to 60 microns thick – on aluminum foil, and then dry it so it doesn't crack," she said. "It was a mess. But we kept at it, and it turned out to be one of the most rewarding things I've ever done. We were able to resolve a fundamental question of science. That's something you don't often get to do as an undergrad." Other Stanford team members included postdoctoral scholars Jongwoo Lim and Sang Chul Lee and chemistry graduate student William Gent. Lawrence Berkeley National Laboratory scientists Stefano Marchesini, Harinarayan Krishnan, Tolek Tyliszczak, David Shapiro and David Kilcoyne also contributed to this work.